„Do you know of any funny music? 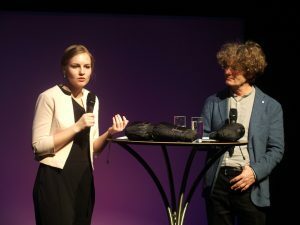 I don‘t!” Musician, choir director and composer Martin Lindenthal quoted Franz Schubert’s famous quotation when he presented pianist Hanna Bachmann’s (25) second album (Gramola label) in the Kosmos Theatre in Bregenz on Thursday night. The CD with the title ‘Plaisanteries’ (French for ‘jokes’) finds the pianist dealing with the subject of humour in the classical and the classic modern piano pieces in this catagory. Bearing this in mind the dialogue between the presenter and interpreter debated this often deliberated theme, while the pianist played especially chosen pieces live for her audience from her latest CD. 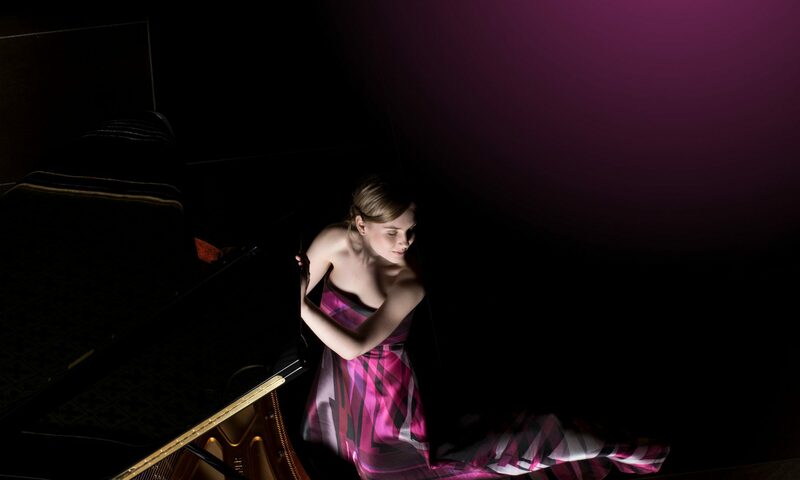 At the present time Hanna Bachmann from Röthis is one of the most up-and-coming piano talents in the country. Recently she has expanded the radius of her concert engagements beyond the boarders of Europe into Mexico, while London and New York will be coming up in the summer. 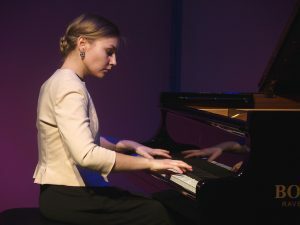 The groundwork for this was her course of studies first by Ferenc Bognar at the music academy in Feldkirch, then by Florian Krumpöck in Vienna and in 2015 she completed her Bachelor and Master’s degree at the Mozarteum Salzburg. This was rounded off with master classes by the legendary Russian pianist Elisabeth Leonskaja, who lives in Vienna, to mention but one. No one less than the Russian Maestro Kirill Petrenko himself gave her professional initial aid when he said: „Hanna Bachmann plays with great musicality, and creativity with a high level of technical skill. Her fine tones and her interpretations are evidence of a mature personality at the piano.“ Maestro Kirill Petrenko is a conductor of world acclaim who will return to his native home with the Symphonic Orchestra with two performances of Mahler’s ‘Eigth’ in May. The Richard Wagner Society (Vorarlberg) affiliated with the Bayreuth-Scholarship in 2017 and with the donated scholarship from the county of Vorarlberg’s ministry of culture. However, awards alone are not enough and effort and performance have to be shown on the practical object itself. This was certainly the case with this young ambitious artist, who already launched her first CD (tyxart) in 2016, which was recorded in the renowned venue of St. Christoph in its ‘arlberg1800’ concert hall. This CD has a profound programme dealing with ‘valediction’ and ‘death’ surrounding the composer Viktor Ullmann who was ostracised by the Nazis. This latest CD was recorded in the historical spa residence in Semmering in Lower Austria last summer, and poses a counterpoint to the latest CD which concentrates on humour in its music. Bachmann had already played two of the three musical pieces, namely Beethoven and Prokofiev, at public concerts as well as by her finals which were well known pieces from her repertoire. The third piece from Mozart lent itself easily to the others. It was interestingly managed by the presenter and the interpreter at the presentation in the Kosmos Theatre showing just how difficult the theme of ‘humour’ in the three pieces of work differ from each other. Martin Lindenthal wanted to relate the old original fun and the whimsical joviality to Wolfgang Amadeus Mozart’s personality. The eight variations about a very simple theme from the singspiel ‘Der dumme Gärtner’ of a so-called Benedikt Schack, KV 613, unlock its effect in which Mozart once again shows the simplicity of his genial workmanship, and which are simply delightfully naive even childish and playful tasty morsels. And no one really wants to believe that this piano piece is actually his last, dating from the year of his death in 1791. Beethoven’s late 33 variations referring to a waltz theme by Diabelli radiate a kind of grim humour, a perversity which makes this audacious piano colossus of nearly one hour unique. Lindenthal quoted the great pianist Alfred Brendel who classified this alleged waltz theme more like a „mixture between a scherzo and a ländler” and you have to agree. The kind of workmanship achieved by Beethoven allows the piece to shine in a totally different diversity; from march to virtuosic nigh impossibility. On the other hand this expression of absurdity, which Prokofiev gave his five ‘Sarcasms’, suffices. A lot of this piece reminds one of „scornful laughing“ (Eva Teimel in the booklet), raging, protesting and in a radical modernity. According to Martin Lindenthal it almost feels so inconceivable as though the pianist is armed with her boxing gloves to play the piano, which she actually did for a split second. In reality, at this point, indeed as she did throughout the whole evening the pianist showed how sure she can play and can react in different musical spheres and situations: with a sophisticated and clear touch of the keys, a healthy technique, a little wink here and there and just in case a portion of deep emotion. The numerous fans and friends in the audience were thrilled.